The Philadelphia school system has been notoriously underfunded, in part because our governor Tom Corbett has slashed state support to the school district because reportedly he wants to crush the teacher's union and move the school system to using primarily privately run charter schools and other types of programs (it is worth noting that the state took over the running of the school district in 2001). The crisis has prompted such things deeply cutting the number of assistant principals, counselors, librarians and school nurses from the public school system as well as the availability of school supplies to city teachers. The cutting of school nurses has potentially caused at least one fatality. In 2013, reportedly a sixth grader was sent home after having a severe asthma attack at school because there was no school nurse available and no one to assess her health status. She died on her way to the emergency room. Did Philly school crisis claim a girl&apos;s life? A 12-year-old girl gets sick and dies in a Philly school that lost its nurse. Philadelphia has been described as one of the worst cities in the country for deep poverty, which is in part related deep slashes in social and welfare services (also facilitated by the conservative leadership of Corbett and his supporters in the mostly white districts in Western Pennsylvania). So school services such as nurses, counselors and other types of school based health services are even more essential than they would be in more prosperous districts (though it stands to reason that none of the more prosperous districts would be forced to run their schools in an environment where they have to weather years of cuts to essential services). 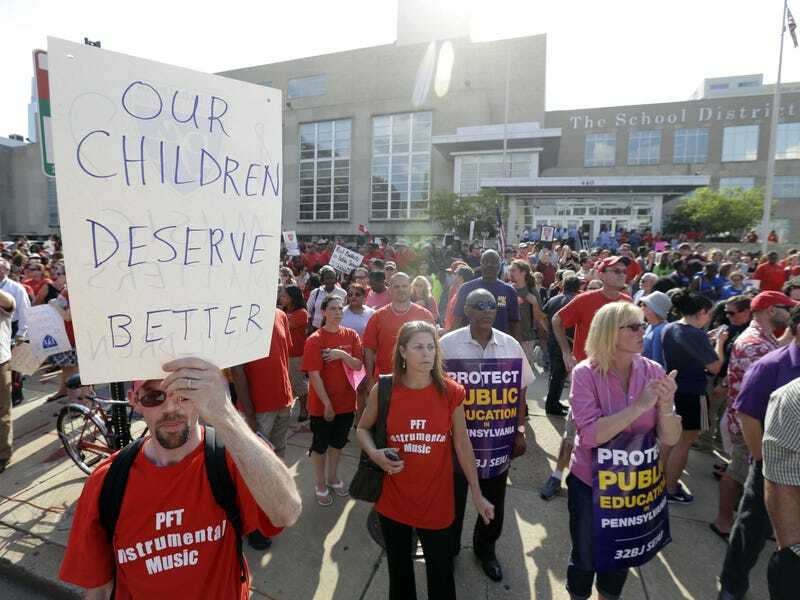 During the spring and summer, officials in Philadelphia have tried to formulate a plan to close a budget shortfall which might prevent the opening of schools on September 8th or at least, cause more layoffs in an already overwhelmed school system. For a while, there was a proposal of a two dollar cigarette tax to help provide needed revenue but Republican legislators protested the bill which they considered pork-filled and not beneficial to their own districts. Corbett suggested a clean bill to be considered during the summer session but the legislators cancelled the August 4th session and cannot even possibly vote on it until mid-September. Corbett did advance the district 264 million dollars last week and the city advanced 50 million but there is still an 81 million dollar short-fall. As a result, Philadelphia public schools are forced to cut 32 million out of their budget to open the schools on time with even more painful layoffs possible if the cigarette tax is not approved. This district with almost 200,000 students cannot afford to keep having services slashed by a state government that has almost a callous disregard for the state of their school system in their largest city. The racial dynamics of the situation are significant. The legislature and governorship is mostly controlled by largely white districts in Western Pennsylvania, whereas Philadelphia is a majority African-American city. The negative effects of chronically underfunded and understaffed schools should not be underestimated. Long term stability for the schools are needed but given the unpredictable funding from the state, it seems likely that Philadelphia school systems will remain in crisis, even if the cigarette tax is passed. As well, slashing school system budget also eliminates thousands of job, furthering the decrease of the tax base in Philadelphia, which in turn, exacerbates the problem. I can only hope that during the election this fall that voters will turn out and elect a governor that has more investment in Philadelphia Schools and perhaps a legislature that may be less punitive to Pennsylvania's largest city. Pic from Philly.com. Also more information about the budgetary issues are here.